(Since I wrote this original post I received a comment below from Glen Finch a Director of Quechup clarifying my problems). As someone who monitors Web 2.0 developments I was aware of Quechup and their controversial email spamming techniques. However as they had claimed to have turned over a new leaf I was somewhat surprised to receive an email from Nicegirl, who indeed did look like a ‘nice girl’ with her adorable puppy. Intrigued, I registered with Quechup and was somewhat disappointed to be greeted with this page. Yet another example of empty promises of Web 2.0? 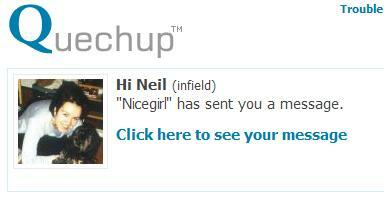 I should say that I was somewhat suspicious of Nicegirl’s user name. As I would be receiving an email from father@christmas.com. A new comment from “Glen Finch” was received on the post “Nice Girls and Quechup” of the weblog “In through the outfield”. As the first comment rightly states you were already a member of Quechup, registered with the username ‘infield’. You then registered (a second new user) and are suprised that you did not have a message in the inbox. Why would you? – this was a new user you had just created, if there had been an email already there from a member this surely would have been cause to raise suspicions, but not the opposite. Let me clarify a few points for you, I do so as a director of Quechup and as spokesman for the company. 1. To receive notifications from Quechup you have to be registered as a user, this is only done by people completing our registration form. We have never purchased emails, shared emails or acquired emails from anyone, period. Moreover our policy states that we will not sell or share members emails or other details and we never have. This means at some stage you or someone that knows your email address registered for you at Quechup. We track and store registration and login details so we can provide the date, time, IP address and country of location where the registration took place. 2. Regarding our address book checker. Yes we received several complaints about the way this worked in September 2007. How it worked was printed directly on the page above the feature (which was optional), the checker has worked this way for nearly 2 years without such complaints. However, given the amount of complaints we realized that address book checkers were much more common on such sites and that users were not reading how they worked before using them and that the manner in which Quechup’s worked was not what had become the perceived norm. We recoded it and changed the way the feature worked within 4 working days. 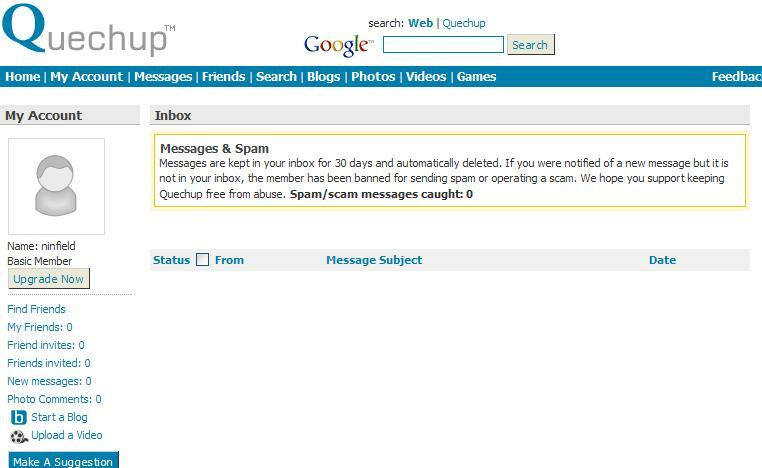 As testiment to Quechup’s policy against spam we have always had the following policies in place: A member cannot send an invite to an email address more than once to stop pestering type spam. Quechup does not send ‘reminder’ emails for invites (unlike other sites such as linkedin) Members can only send messages to 1 member at a time to stop the service being used for bulk mailing. Finally, and perhaps most importantly, Quechup is certified by SenderScore the industries leading email ‘SafeList’ accreditation program. Companies such as Windows Live/Hotmail, Yahoo! Mail and SpamAssasin use and rely on SenderScore for providing a SafeList of email senders. In total over 67% of consumer mail boxes in the world depend on SenderScore as to wether email is safe or spam. Maintaining this accreditation means adhering to strict anti spam policies and meeting criteria from Windows Live, Yahoo!, SpamAssasin and other sources on a daily basis. This entry was posted in Uncategorized, Web 2.0 on 2 April 2008 by ninfield.